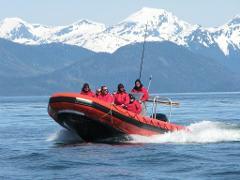 Your excursion begins at the outfitting shop at 105 B Monastery St. in Sitka Alaska where you will be outfitted for your excursion. 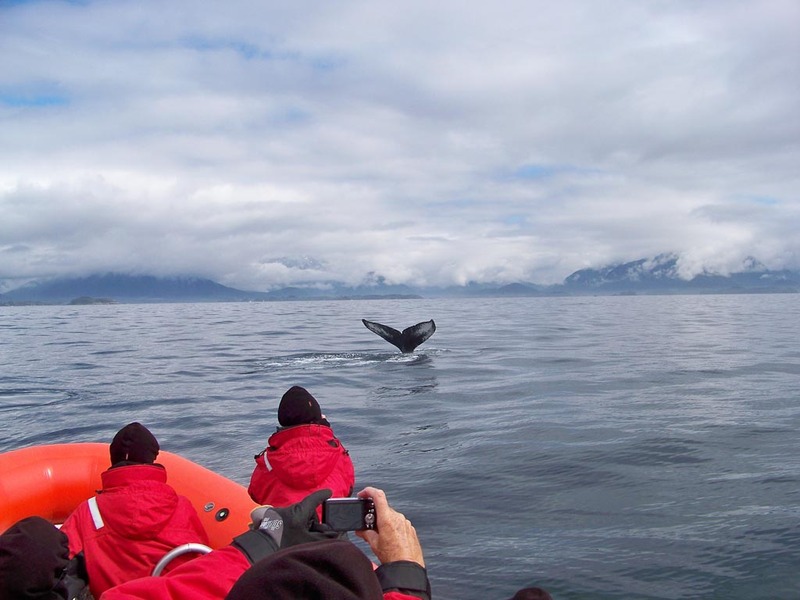 Your gear for this trip will include a special clothing that will protect you from the elements allowing you to be warm and comfortable outdoors in Alaska. Then your captain and guide will take you on an ocean adventure to St Lazaria Island. 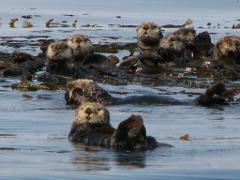 This island is part of the Alaska Maritime Wildlife Refuge Home to thousands of nesting sea birds. The volcanic geological features of this island are nothing short of breathtaking and there is no better way to appreciate them than from the open seating of the ocean rafts. 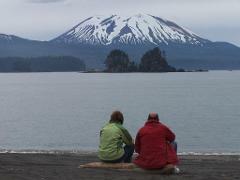 From St Lazaria your captain will steer a course along Kruzof Island home to the Mt Edgecumbe Volcano. This coastline is a mix of black sand beaches and lava flows from the volcano. This unique geology is perfect habitat for A multitude of species of birds, fish, whales, marine mammals in a setting so beautiful it can hardly be described. 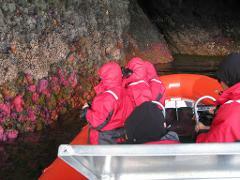 After touring for approximately 2 hours on the ocean raft you will arrive at Mud Bay where you will disembark. 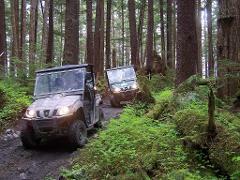 Now you will get to drive Yamaha Rhino OHV's in the Tongass National Forest. This is a very special experience because there are only certain places in the forest where you can drive OHV's and Kruzof Island is a great one. 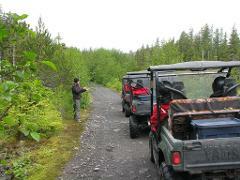 The trails lead through mixed forest and muskeg areas and along the way your guide will stop tell you about the forest. 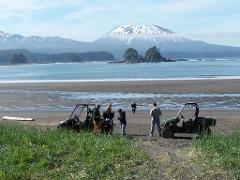 After riding for about 40 minutes you will arrive at a beautiful estuary called iris meadows. In season you will find fields of Purple Irises and Alaska cotton as well as many other wildflowers. 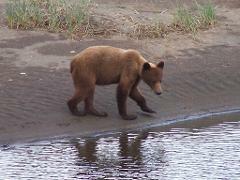 This estuary is a great food source for Alaska Coastal Brown Bears and Sitka Blacktail Deer. 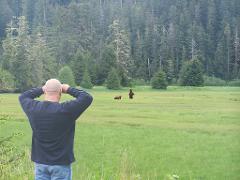 The open vistas of the meadows make for great locations for viewing wildlife and taking pictures. After enjoying the scenery you will ride on another 20 minutes or so to a beautiful ocean beach called North Beach. You can ride right down at the waters edge in the black sand. Your guide will direct you to a location were you will stop and have lunch while taking in the views and listening to the surf. 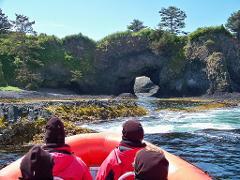 After lunch you will ride back to the rafts that will take you back to Sitka through the island passages. Back at the outfitting shop you can enjoy refreshments and share memories as you gear down from your excursion. The memories made on this excursion are sure to last a lifetime.